An Israeli military force invaded Al-Far’a area in the eastern part of the West Bank near Tubas near the Jordan Vally. The military took photographs of the existing water aquifers in the area, and informed the residents that they will come back to destroy the aquifers.Hussein Al-Hmud, head of the village council of Al-Far’a said that destroying the aquifers will harm most of the residents who highly depend on these water resources for their agriculture which is their only source of income. In addition destroying the water resources will deprive all the region from its main source of drinking water which will cause a serious problem in the area. Israel controls most of the water resources in the West Bank. 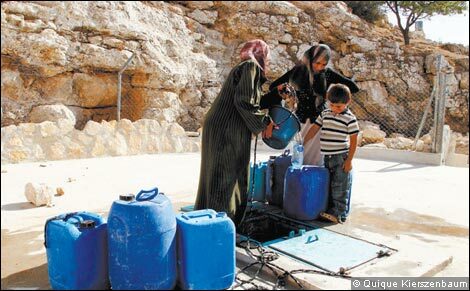 Palestinians are not allowed to dig for water wells without Israeli approval, which is rarely granted. Palestinians buy their water from Israel who pumps it out from West Bank aquifers and pay more than Israeli citizens and settlers pay.